The Indian cricket team seems down and out after back-to-back losses but senior Australian batsman Michael Hussey remains wary of the tourists as he feels their "pride and experience" can conquer the intimidating conditions that await them in the third Test starting here on Friday. The mounting criticism of their poor show in the Test series against Australia notwithstanding, the Indian cricket team today chose to enjoy some go-karting instead of having a net session ahead of the do-or-die third match starting here on Friday. The Indian Olympic Association (IOA) has retained veteran sports administrator K.P. Singh Deo as the convener of the high-powered Olympic Games Monitoring committee. The other members of the committee are IOA acting president Vijay Kumar Malhotra (chairman), secretary-general Randhir Singh (vice-chairman), president or secretary-general of every qualifying federation and one sportsperson as “athlete representative” from each qualifying federation. Former Pakistan captain Rashid Latif today suggested that Indian batting icon Sachin Tendulkar should take counselling from a sports psychologist to get over the "mental block" caused by the continuing wait for his elusive 100th international century. Sachin Tendulkar has been in fine form in Australia but a hundred has eluded him. The only thing that matters to a child on the field is how he plays. Not the money, not the future, nor possible stardom. When you put together, on one platform, kids from over 32 teams and that too in rural Punjab, you get purest and most exhilarating form of footballing action, spread out over 115 matches. The present tour of the Indian team to Australia is not only a disaster from cricketing point of view but it is also turning out to be a catastrophe as far as public manners go. When German football giants Bayern Munich take on the Indian team in an exhibition match at the Jawaharlal Nehru Stadium tomorrow evening, it will be a mismatch of huge proportions. Bayern Munich, despite having little knowledge about Indian football and its lowly rating, are determined to put on their best show when they taken on India in a exhibition match of the Audi Football Summit here tomorrow. On the occasion of the 2nd Anniversary of the The Academy of Golf at the CGC, President Raja Malwinder Singh will be honouring all those who have brought laurels to the Chandigarh Golf Club. The ceremony will be held at the Academy of Golf, CGC on Thursday Jan 12 at 3.30 pm. "The goal is to go 3-0...and we haven't spoken about 4-0 yet. To go 3-0 up will be an awesome achievement but the Indians have great players with a lot of experience and pride. I am expecting them to bounce back quite hard in this Test," stated Hussey who has run into form with successive innings of 89 and unbeaten 150 in the last two Tests. "This pitch will have extra pace and bounce. We play very well in these conditions but this is different to Indians from their home country. Yet, as I said, they have unbelievable experience; they have been here before and performed well. They can adapt to conditions pretty quickly," he added. It was the Indians' pride and steely determination which made them win the last encounter between the two teams at this venue in 2007-08. "I remember the last Test very well. There was controversy coming into this Test (after Sydney) and it sort of galvanised them. They came here with a steely determination to do well. "At that time I didn't feel so but it did affect the team (Australian) a little bit with what was happening outside cricket. But they also played some outstanding cricket. It was the birth of Ishant Sharma who bowled unbelievably well. It was phenomenal bowling. Indians were too good in that game." The team of 2007-08 was brilliantly led on that occasion by Anil Kumble and the present one is also being headed by someone whom Hussey regards as a very good captain. Struggling Indian batsmen are in for a tough challenge during the Perth Test as the WACA pitch is expected to be significantly quicker this time around. "We hope to have at least extra 20 per cent of pace and bounce (from the pitch of 2007-08). We are aiming for a similar pitch as last year which has more pace and bounce," said curator Cameron Sutherland to mediapersons this morning.' Interestingly, when the Indians played at WACA last time in 2007-08, they had won the match. The pitch at WACA has mythical legends around its pace and bounce and the stuff of Dennis Lillee and Jeff Thomson is the stuff of legends in cricket annals. The curator promises it to be the return to those times of 70s and 80s when exceptional pace and bounce was witnessed on this surface. "We have changed our soil type. We have tried to bring the traditional WACA characteristic of pre 1980s days. It has taken us a fair while to achieve it. We have changed the grass type, redeveloped the whole block. We are pretty close to mark now," said Sutherland. The curator said there are significant differences from the earlier pitches of, say 2000 era. Former Australian opener and WACA CEO Graeme Wood foresees a torrid time for Indian batsmen at the dreaded pitch as he feels the dominant hosts will unleash an all-pace attack in the third Test starting here on Friday. The mounting criticism of their poor show in the Test series against Australia notwithstanding, the Indian cricket team today chose to enjoy some go-karting instead of having a net session ahead of the do-or-die third match starting here on Friday. For the third day in running, the beleaguered team chose to keep itself away from cricket. While the cricket fans back home are up in arms and former players are baffled by their take-it-easy approach, the team is insistent that taking mind off the game is the best way to get ready for the decisive game. Down 0-2 in the four-Test series with crushing defeats in Melbourne and Sydney, the third game is a must-win for the tourists who are beset with bowling and batting issues. "The first Test ended on the fourth day and the next day was a free day. But did the Indian team practice? I don't think they practiced. Why did they not practice? Nobody knows," Sunil Gavaskar has stated. The committee has been constituted to involve sportspersons qualified for the Olympics and their federations in preparation of the contingent for the London Olympics. The IOA has also made no change in the four-member Marketing Committee, headed by All-India Tennis Association (AITA) secretary-general Anil Khanna, to look after the marketing (Sponsorship and TV Rights) for the Olympics. Malhotra said today that by reconfirming these committees along with the reconstitution of the Arbitration and Ethics Commission, “we have fulfilled our commitment to make the IOA more inclusive and transparent”. “Now qualified sportspersons will have a say in the training and preparation of the teams for the Olympics and the decision to reconfirm and reconstitute the committees was done as per the decision taken at the Annual General Meeting (AGM) of the IOA,” explained Malhotra. Malhotra said efforts were being made to generate “our own resources for sending the contingent to London”. “We have set up a Marketing Committee with knowledgeable people and experts in the field so that we do not have to depend on Government grants for sending athletes for the Olympics and other major international events,” he added. The other members of the Marketing Committee (Sponsorship and TV Rights) are Raninder Singh (President, NRAI), S. Ragunathan (President, Kayaking and Canoeing Association) and N. Ramachandran (Treasurer, IOA). "He is under pressure no doubt about it. He might not admit it but he is facing a mental block because of this hype over his milestone. It would not be a bad idea for him to get some counselling from a sports psychologist," Latif suggested. "He is batting well and he is looking good out in the middle. It is just a mental block and pressure that has prevented him from reaching this milestone earlier," he told PTI. India lost the first two Tests after batting collapses with Tendulkar scoring a half century in each match but failing to get to his elusive 100th international hundred. Latif said he had a feeling that Sachin would get the hundred in the final Test and definitely in the series. He said the world's top athletes at some time in their career required counselling to get over mental blocks. "It can happen to anyone," he added. The Indian maestro's last international century came against South Africa in March last year. Latif pointed out that there was no other plausible reason for Tendulkar not scoring his 100th international hundred. "I have seen many of his innings in the last 10 months and in these two Tests and he is definitely not out of form or facing issues timing the ball. He is moving well and is balanced at the crease this can be judged by the fact that he has scored runs but fallen short of the hundred," the former Pakistan captain pointed out. Latif also felt that critics and former players calling for the heads of their senior batsmen need to accept that India didn't have the bowling firepower to bowl out Australia twice. This might sound like an aberration but with the successful hosting of the inaugural edition of the Edu Football League, an initiative by Youth Football Club, Rurka Kalan, this unlikely dream has indeed taken shape. The league saw various workshops conducted for the participating kids. From personality development to art, craft and even drama. Children from various villages from all over the State poured in and the concept caught everyone’s fancy. The organisers also distributed Rs. 1500 worth of playing gear - an all-inclusive sports kit - with uniforms, track suits, studs and footballs as well. Even the travel, lodging and boarding were taken care of by the organisers, ensuring that all these kids had to think about was their game. As an added incentive, as most of them are from rural backgrounds, the 25 most promising footballers from the league were also gifted bicycles. The league saw some real battles on the field after it started on October 23 and till January 7, it held its grip on the minds of all the players and locals as well. Rurka FA lifted the title in the under-12 age-group, while FA Bundala finished second. In the U-14 group, Baba Chinta FA, Rurka Kalan, were the winners and Aluna Tola FA held on to second place. YFC Bundala grabbed the top spot in the U-16 category while Rurka FC were close second. A cultural programme organised on the occasion saw performances from famed Punjabi singers like Balraj Sodhi, Roshan Prince and Rana Ranjit. The chief guest for the closing ceremony, S.P. Singh Oberoi, chairmen Aprex Group of Companies Dubai, made a donation of Rs 5 lakh to the Youth Football Club. The ceremony also saw all the participants being felicitated. Not a single kid looked was ready to spend time away from the ground. Football is catching on in this region and there was ample proof of this as every player’s name was welcomed with thunderous applause. Football is doing its bit, proving once again how sport is not all about just a mad rush of the blood. It is therapeutic, often life-changing, and when you see these kids smiling, ear-to-ear, you won’t even bother asking why! The present tour of the Indian team to Australia is not only a disaster from cricketing point of view but it is also turning out to be a catastrophe as far as public manners go. Paceman Ishant Sharma showed his middle finger to the assembled cricket fans as he along with his team mates, went to do go-karting at a local club here, Indian television channels reported today. Quite a few Indian cricketers, including skipper Mahendra Singh Dhoni and batting icon Sachin Tendulkar, went this evening for go karting and were apparently ruffled to see a posse of TV cameras and mediapersons following them in hot trail. Despite all attempts to keep the media out of bounds, they could have their pictures and videos much to the cricketers' annoyance. It apparently led to Sharma showing his middle finger to a heckling crowd which had also gathered there, the reports claimed. It's the second time when an Indian cricketer has shown his middle finger at fans during the tour. 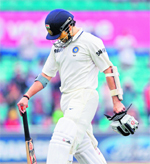 Virat Kohli did so during the second Test at SCG and was fined 50 per cent of his match fees. Indian Team's Media Manager G S Walia said he was not aware of any such incident. "I am not aware of any such incident (Ishant showing the middle finger)", he said. The Indians are light years away from attaining the Bayern standards, the top club of Germany, nay one of the best in the world. Yet, the match will afford the hosts an estimate of where they stand talent and technique-wise, compared to the class and calibre of the visitors. Bayern Munich’s visit has been facilitated by German auto major Audi, and the All-India Football Federation’s agreement with the Sports Authority of India will allow the Nehru Stadium to be used free of cost, other than the bills for basic charges incurred for utilities like water, power and maintenance of the stadium for the day. India have played hosts to big clubs in the past too and the Nehru Stadium was particularly lucky to host many high-octane contests when the Tatas had brought top European and Latin American clubs in their Super Soccer Series in the 1990s. But the visit of a club like Bayern is one of a kind and the Indian players and fans stand to watch and learn a lot from them, when they unveil their wares at the flood-lit Nehru Stadium at 6 p.m. tomorrow. The stadium had hosted the SAFF Championship recently and India emerged victorious beating tough as nails Afghanistan in an engrossing title contest. Though Sunil Chhetri, who had emerged as the top-scorer with seven goals in the SAFF Championship, will not make the line-up tomorrow, owning to injury, the exhibition tie will be a befitting farewell to former captain Baichung Bhutia, who had announced his retirement from international football last year. The proceeds of the match will go for another cause - to the earth-quake victims of Sikkim - but what the fans would be looking forward to is the soccer wizardry of the Germans. There are six players in the Bayern line-up who had played in the last World Cup in South Africa, including Thomas Muller, who was voted the best young talent of the showpiece event with the Golden Boot award, German captain Phillip Lahm, one of the world’s best full-backs, Mario Gomes, Dutch striker Arjen Robben, French mid-fielder Franck Ribery and Bastian Schweinsteiger. Strikers Muller, Robben and Gomes will marshal the Bayern attack, which will be hard to contain. The Germans were in Doha for the past one week, training without any distraction, and the only matter of debate is how many goals they would win by. Bhutia and Co. feel that the match would be a God-sent for them to play against some of the legends of the game and they stand to learn a lot, which no coach or camp could provide. Though Bhutia, doubtful of lasting the full course of the match due to injury worries and fading stamina, is thrilled at the prospect of playing in such a high-powered game, India have no illusions of making any impact on the visitors. The Indians will certainly do their best even that will not be good enough to even tease Bayern, provided of course the Indian goal gets any respite from the fusillade of volleys by the Bayern strikers. Bayern’s trip to Delhi is part of their preparation for the German soccer league, the Bundesliga, as they have 22 league trophies in their show case, besides four Champions League titles. Though a thumping win for Bayern Munich is a foregone conclusion, Bhutia could not have asked for a better farewell to from his illustrious international career. “We are among the top five clubs in Europe, and we want to show what European football is all about,” observed Bayern captain Philip Lahm at a media interaction tonight. The German team arrived to a warm welcome, which they said they expected, and so far their stay in the Capital has been pleasingly welcome. But they expect to put their best foot forward when they take on India, led by Baichung Bhutia, and the signs for the hosts are indeed ominous. Bayern, who trained in Qatar for a week before landing in Delhi today, had given a 13-0 spanking to the Qatari team in a warm-up match. The Qataris occupy a slot many notches higher than India. Bhutia had retired from international football six months ago, but when offered a chance to make the match against Bayern his swan song, the Sikkim ‘sniper’ jumped at the once in a life-time opportunity. Bhutia and coach Savio Medeira said they were well aware of the gap in standard between the teams and therefore hoped that they would play as well as they were capable of. Bayern have come here partly for understanding the culture and country and of course to know about Indian football, as Audi is willing to play a key role in the development of the game in the country. 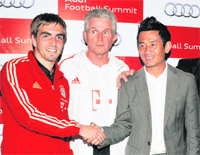 Lahm said he had heard about Bhutia playing for a World XI, but knows little about Indian football as they get to see nothing of India’s game back home, “barring watching little bit of Indian cricket”. “Everyone is fit, raring to go. We will play an entertaining match. This is our preparation ahead of the second stage of the German league. It’s a real test for us,” added Lahm. Bayern are put up in a luxury hotel and are keen to taste Indian food, but for the present, they would rather trust their own cook, brought along with the team. “We have come here to win,” asserted the skipper, who was flanked by coach Jupp Heynckes and star player Bastian Schweinsteiger. Heynckes said Bayern’s success was that the club always kept abreast of the latest in the game and along with talent, they adopted modern coaching methods and sciences to make the team one of top five in Europe. Against such a squad, the team led by Bhutia will have a lot of catching up to do, in all its wider meaning. According to Director of the Academy, Arjuna Awardee, Harmeet Kahlon, golf acheivers of all categories including juniors, sub-juniors, playing professionals, amateurs, seniors and teaching professionals will be honoured at this function. Jeev Milkha Singh has confirmed his participation as have other players including Sujjan Singh, Gaganjeet Bhullar, Harinder Gupta, Ajeetesh Sandhu, Harmeet Kahlon. Among the juniors, sub-juniors and girls will be Aadil Bedi, Karandeep Kochar, Jaiveer Singh, Vasundhara Thiara, Feroz Gujaral, Aadilbeer Singh, Jairaj Singh, Tarundeep Chadha. Amateurs include Abhijit Chadha and HS Kang. Among the seniors there will be IPS Mann and Simran Singh while Pal Singh will be honoured for lifetime teaching contribution to the Chandigarh Golf Club. Among the coaches, Jesse Grewal and Manjit Kochar will be honoured. DPS Khanna and British School Chandigarh will be honoured for promoting golf in schools at the grassroots level.